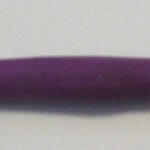 This is an unbiased review of an ergonomic crochet hook set by Athena’s Elements. FYI, I have not been paid for this review; I have not received free product in exchange for my opinion; nor have I been prompted in any way to write these comments. This was written purely on my own accord to help those who are shopping for ergonomic crochet hooks to help them in their crafting endeavors. Now that the facts have been made clear, I hope the following will help you in making your decision on what YOU should get! I have been crocheting since I was very young (and I am now considered a senior citizen by some criteria). I have always used the standard thin metal crochet hooks. I have gravitated toward using the Boye-style hooks because that’s what I learned on and have used for many years, so I’m used to working with them and hence, prefer them over other style hooks. The set I purchased came with a cute case with a Velcro closure. There were color options to choose from, so there should be some color that will appeal to most anyone. The set comes with 11 crochet hooks ranging from size B (2.25mm) to size J (6.0mm). 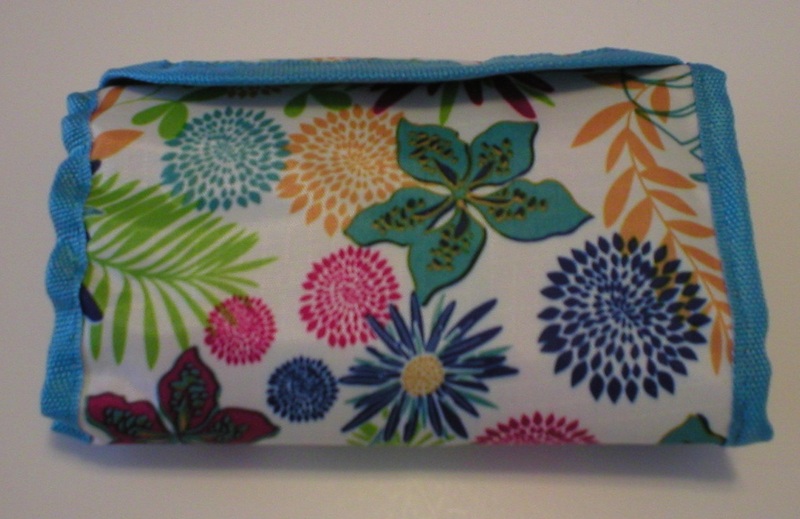 The case holds all the hooks in their own small slots, and also come with a packet of stitch markers (like plastic safety pins), a hook size conversion chart, and a nice letter from the founder of the company. The case feels sturdy and I imagine it will outlast my lifetime. The hooks seem to be of excellent quality and as long as I don’t lose them, they should also outlast me. The hooks all have different colored handles, so that makes it easy to find the hook you need if you’re working with the same few sizes routinely. There is 1-1/2″ length of the metal hooks before the start of the grip handle. I have found this to be enough length when making my crochet cloths. I have not tried it with some of the elaborate stitching techniques that may require more hook length. You would need to determine if that’s enough length for projects you typically make. The hook end is a Boye-style tip. I find that easy and desirable to work with. However, that may be simply personal preference. The hook size marking on the handle only indicates the mm size, not the US conversion (ie 5.0mm=size H). The mm size is marked on the upper handle of each hook by being cut into the grip on the hook. This way the marking should never wear off nor wear down because it’s on a part of the handle that you don’t hold consistently. The fact that only the millimeter size is indicated on the handle is only a slight inconvenience for me, since I’m used to using the US lettering system rather than millimeter sizes. As long as I don’t lose the conversion chart, I should be OK. 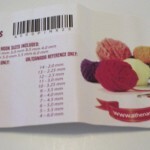 However, I’m sure that conversion information could easily be found on the Internet if the guide does get lost. This may be an issue for some people, but overall I feel like it’s only a slight problem that can be shrugged off. Above all, the ergonomic grip handles are why someone would purchase this set in the first place. I don’t know what the grip handles are made from…probably some type of rubber or vinyl with a texture or “gripiness” to it. The “gripiness” prevents the hook from slipping in my hand or along my fingers. I will admit that the feature took some time to get used to. However, after a few days of adjustment, I wouldn’t trade it for anything. 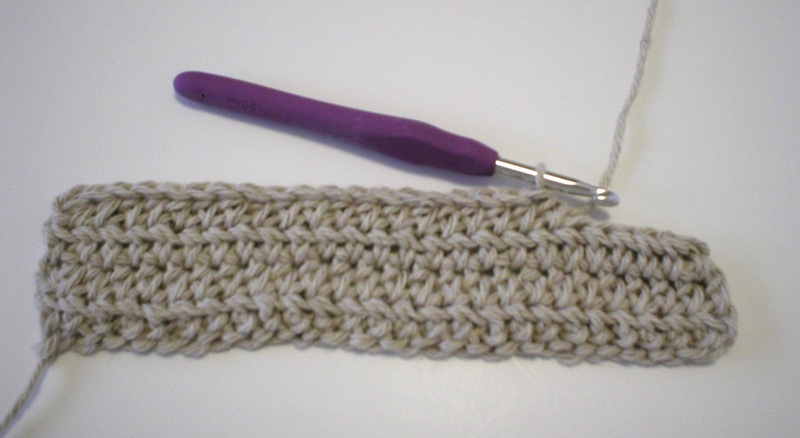 That feature allows me to release my “death grip” on the crochet hook and hold it much more loosely because it doesn’t slip in my fingers. This relieves any tension in my hand and has virtually stopped my numb fingers. I no longer have a “tired” hand after crocheting for some period of time! Also, the grip handles have a shape to them where you hold them allowing for a good yet light grip, again without having to hold it tightly, and without it slipping in your hand as you work. It took me several days of using these hooks to actually adjust to working with them comfortably. During that time, I wondered if I could really use them in my work. 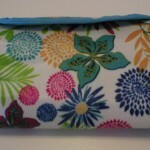 But with time, I adjusted and regained my speed and accuracy in making my stitches. Other people may not need such an adjustment period. I feel the effort was well worth it because of the relief I feel in my hand with the thicker, non-slip, easy grip handles. No more death-grip on the hook. No more numb finger tips. No more tired hand and wrist muscles. No aches and pains! The time it took to adjust to these new ergonomic crochet hooks was well worth it, and I don’t believe I’ll ever go back to standard less-than-pencil-thin crochet hooks. 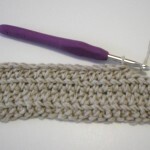 I truly hope this information can help you in making your personal decision about any changes you need to make in your crochet tools. The change was worth the effort for me and I highly recommend these hooks! Let me know (in the comment section below) if this information has been helpful to you! 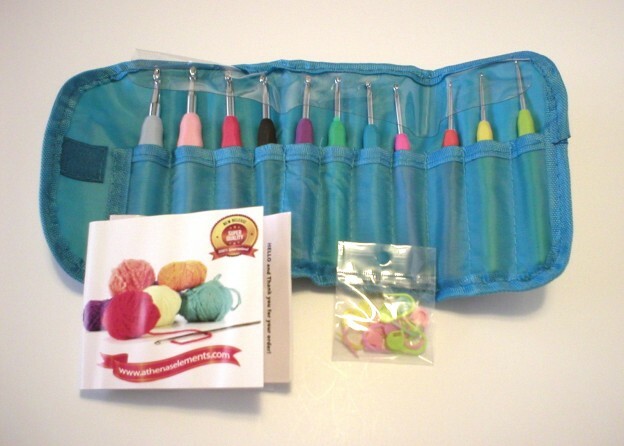 This entry was posted in crafts, Crochet and tagged Review of Athenas Elements crochet hook set, Review of crochet hook set, Review of ergonomic crochet hooks on February 29, 2016 by Judi.